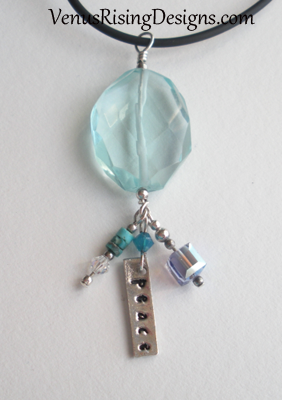 This mellow necklace features a faceted, aqua quartz bead with dangles made with turquoise, AB tanzanite (very light purple) Swarovski crystal, and sterling silver beads, and a sterling silver "Peace" charm. Comes on a black leather necklace with sterling lobster clasp, 18". I can change the Peace charm to a "Love," "Hope," or "Faith" charm; make your choice in the drop-down box.